Great American Network | Art - Velazquez "Las Meninas"
"Las Meninas" (Spanish for "The Maids of Honor") is a 1656 painting by Diego Velazquez, the leading artist of the Spanish Golden Age, exposed at the Museo del Prado in Madrid. The work's complex and enigmatic composition raises questions about reality and illusion, and creates an uncertain relationship between the viewer and the figures depicted. 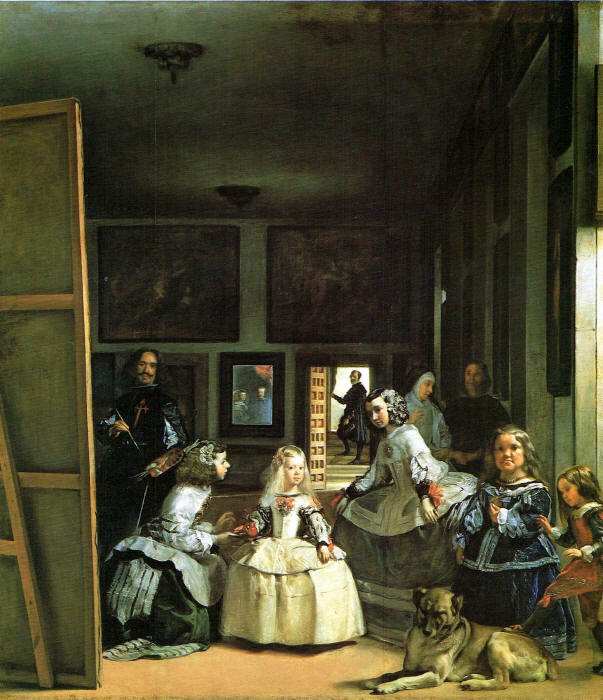 Because of these complexities, "Las Meninas" has been one of the most widely analyzed works in Western painting. The painting shows a large room in the Royal Alcazar of Madrid during the reign of King Philip IV of Spain, and presents several figures, most identifiable from the Spanish court, captured, according to some commentators, in a particular moment as if in a snapshot. Some look out of the canvas towards the viewer, while others interact among themselves. The young Infanta Margaret Theresa is surrounded by her entourage of maids of honor, chaperone, bodyguard, two dwarfs and a dog. 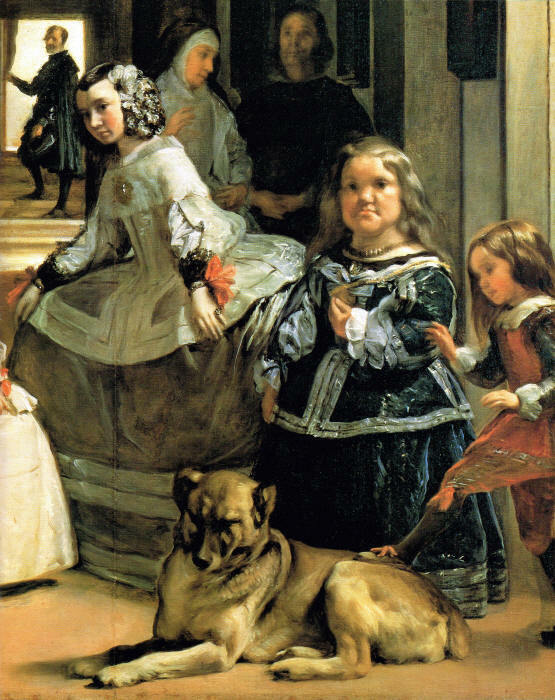 Just behind them, Velazquez portrays himself working at a large canvas. 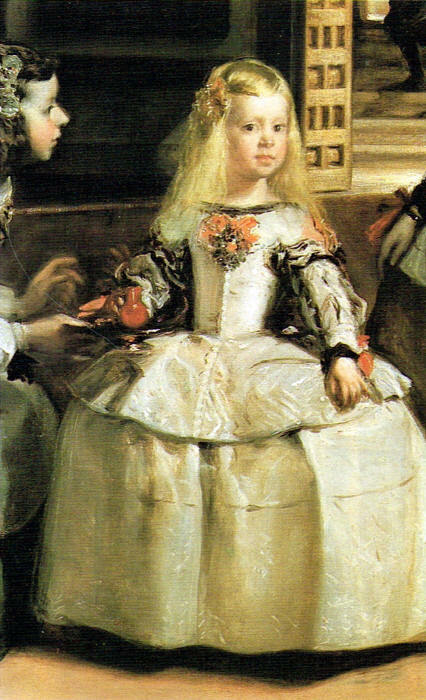 Velazquez: Detail of his self-portrait in "Las Meninas"
Velazquez looks outwards, beyond the pictorial space to where a viewer of the painting would stand. In the background there is a mirror that reflects the upper bodies of the king and queen. 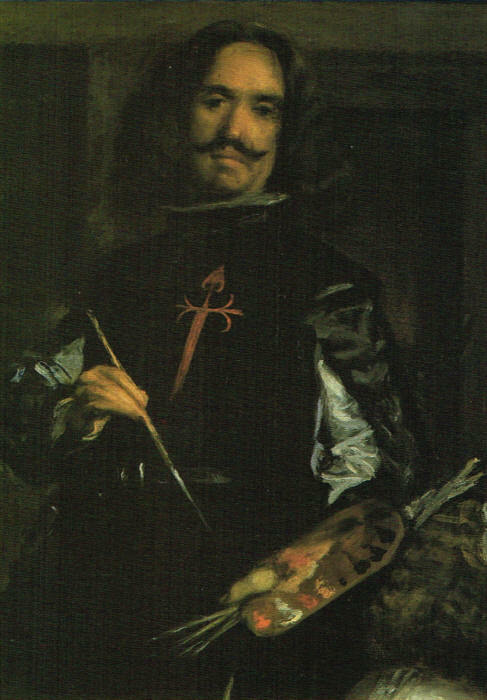 They appear to be placed outside the picture space in a position similar to that of the viewer, although some scholars have speculated that their image is a reflection from the painting Velazquez is shown working on. "Las Meninas" has long been recognized as one of the most important paintings in Western art history. The Baroque painter Luca Giordano said that it represents the "theology of painting" and, in 1827, president of the Royal Academy Sir Thomas Lawrence described the work in a letter to his successor David Wilkie as "the true philosophy of the art". More recently, it has been described as "Velazquez's supreme achievement, a highly self-conscious, calculated demonstration of what painting could achieve, and perhaps the most searching statement ever made on the possibilities of the easel painting".